A shining gem in the sea of indies, made by 3 programmers and 1 sound designer. Team Cherry created nothing short of a masterpiece which will easily stay in my top-ranked ganes for years to come. Hollow Knight is Dark Souls done right as a platformer – a true Metroidvania and fierce competitor to the best in the genre out there. But much unlike the Souls-series, Hollow Knight manages to combine its rather dark aesthetics with playful, colored and varied designs. Add to that a tremendous soundtrack and varied ambience and you cannot help but feel enraptured by this game’s beautiful world design. But let’s start where every good story begins: the opening sequence. 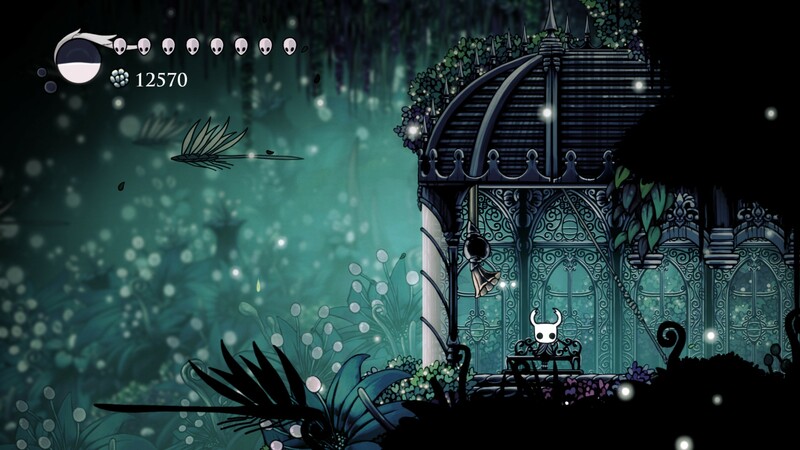 Even with the sad undertones, all areas in Hollow Knight feel huge, colorful and diverse. Exploration is always rewarded with lore and new items. Playing as a small bug you are just equipped with your rather small “needle” weapon – which basically acts as sword in this world’s terminology. 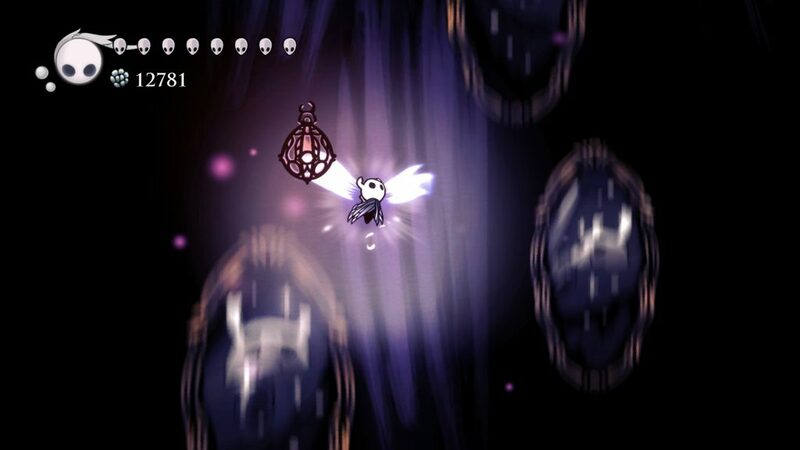 Your origins and past are unknown, literally dropping you into a huge kingdom called Hallownest to explore. Aside from some basic tutorial button queues the game soon confronts you with other characters to do the explaining, all of which being bugs, crawlers or insects of some design. And it’s right at minute 1 where this game starts to enthrall you as player with all its uniquely designed characters and ideas. All dialogue is well-written, revealing hidden meaning in things you find out just much later. Characters unveil small hints and remain vague enough to keep your imagination going, allowing you to fill most of the gaps in the world that seems to have forgotten its past. Exploration is generally rewarded with depth and more immersion, which is a great motivator to keep going in any Metroidvania. Exploration and storytelling are on a high-quality level throughout the 25-30h journey. You can’t help to stop and soak in the atmosphere every now and then! Using this initial spark of explorative motivation the gradual difficulty curve eases you further into the game, which is – in my opinion – a far better approach than that of other Souls’y games. You get to soak up the dense atmosphere while the more advanced gameplay mechanics stay out-of-the-way, much like Metroid did it. However you still get to enjoy original ideas such as having to stand still to focus and heal your shell, a mechanic as simple as it is brilliant to observe throughout the later parts of the game. Aside from this mechanic there’s just jumping and swinging your nail into four basic directions, with much more mobility to come later down the line. 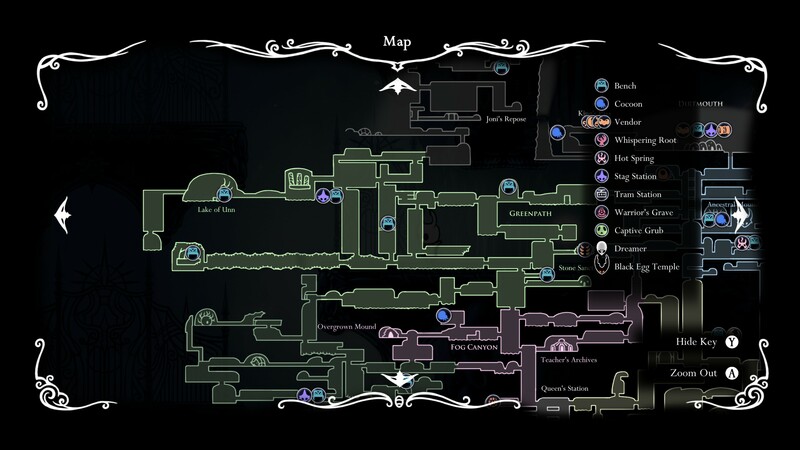 It’s quick to learn – and yes, might even be too simplistic for the inclined platform connoisseur – but clearly shows that this game does everything to be instantly recognized as a true Metroidvania in every way. But just a few more minutes in you’re free to enjoy and explore what turns out to be one of the biggest and secret-packed world’s I’ve ever got to enjoy. There are hidden secrets and meanings in almost every corner, barely any unnecessary paths or dead ends to take. Every corner of the world “feels” like it has meaning and purpose to it, which is a great feat to achieve by the designers of this game. As in every good platformer, the only limiting factor of exploration are your skills and unlocked abilities, making exploration and upgrades feel meaningful and have impact. You’ll soon enough encounter ways to overcome obstacles and learn powers that feel mighty and intuitive to use, gradually increasing your intially simple repertoire with spells and movement abilities. Especially in the later game the bossfights can get frantic and brutal. However the path is always yours: If fights are too hard you can always come back later after you unlocked more equipment. With all the talk about initial simplicity you shouldn’t get me wrong here – the difficulty barriers will hit you soon enough – and hard! The game clearly know’s about the possible directions you can take, but the freedom of exploration allows you to get wildly different experience in terms of difficulty, just depending on the routes you take. 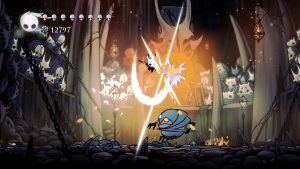 Hollow Knight features a metric ton of boss fights which have their unique designs, but sometimes lack in depths as the developers cannot truly say which abilities you’ve unlocked yet. Characters usually give you a general hint on where to go and find upgrades, sometimes flatout warning you that you’re currently out of your league in your area. But it still needs to be said that the freedom of direction also can be hindering. Much like in Dark Souls, safepoints – in this game represented through benches to sit on – are oftentimes spread far apart, which can be harsh when you die far away from the last safepoint or fail to find a bench prior to a boss fight. But even if you do well you should get used to dying often, as it is an essential part of the game. So just a word of warning: be prepared for many, many repetitions in order to learn the patterns and sometimes very brief attack telegraphs, or you won’t enjoy this game at all. The journey is the way to enjoy this game. 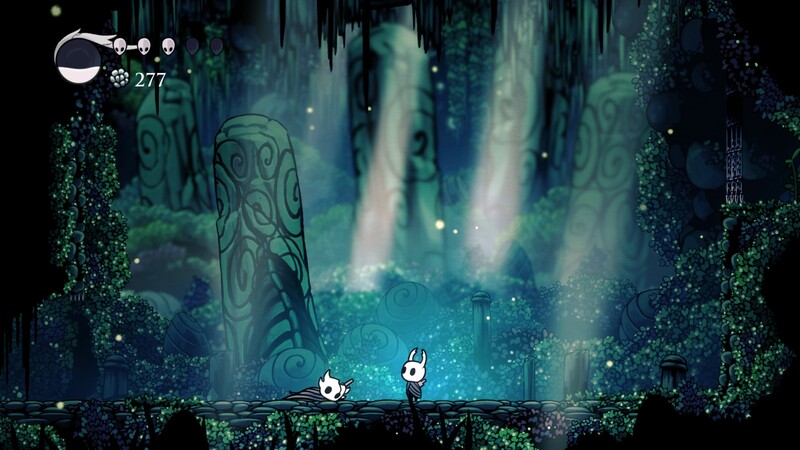 Calm moments emphasize the dense moments in Hollow Knight. With death around each corner a bench to sit on can feel very inviting indeed. 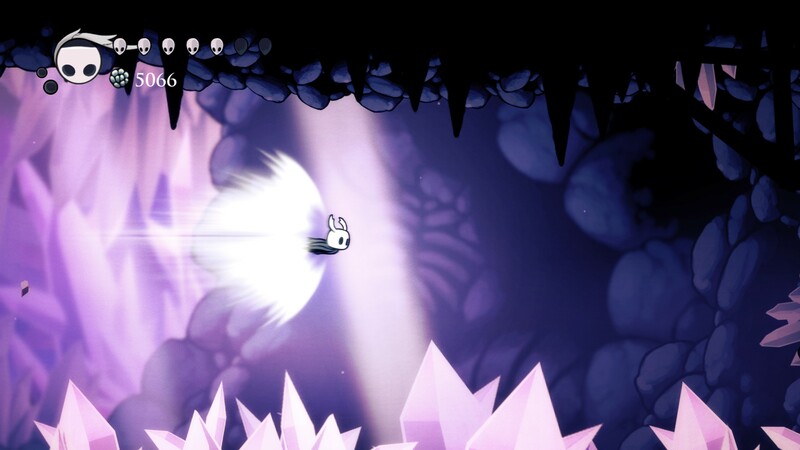 Dying in “Hollow Knight” means that you have to survive the way back to your shadowy corpse, which you must then defeat to retrieve your currency called “Geo”. And this is rather important to know because nothing in this game is free to get, not even your markers for position and various point-of-interest on the minimap. A lot of upgrades can just be bought with geo, which you can find in chests, rocks or by killing enemies. This means that if you are not careful and lose the currency a lot of your progress is wasted at a moment’s notice. It’s a thing to plan for when venturing down below, and the task to even find your corpse in maze-like areas can be rather daunting, especially when you haven’t unlocked the map for a particular area yet. It’s part of the thrill in the early game, but also a huge obstacle for beginners and can be seen as a downside to this otherwise fun to explore world. 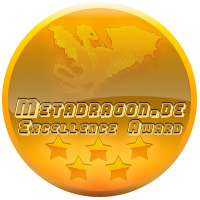 …and it’s great! Hallownest and its inhabitants offer a lot to look at. Huge diverse areas ranging from crystal mines, dense forests motivate you to explore every last inch, slowly completing the base maps you can buy for geo. 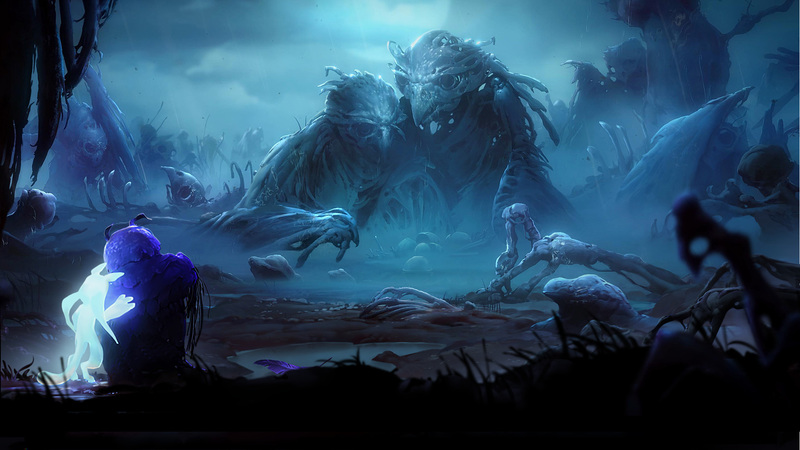 There are populated areas of civilisations long gone, but also completely desolate places taken by the wild, including its on unique set of buggy enemies. My personal highlights is a pitch-black chasm full of mindless, ravenous and vicious insects crawling everywhere, a place where you feel clearly unwelcome and out of your own league. During my journey I felt a wide range of emotions, randing between marvel of unknown wonders and adrenaline-fueled nightmares in pitch-black darkness. It’s always a great feeling to finally find and unlock new paths after a long fight, and filling the gaps in your map gives you a good grasp of this truly huge world. Well, “huge” doesn’t even describe it well enough: whenever you thought an area fully explored a new secret passage or hidden wall reveals itself, making the world feel all the more substantial and tangible in the process. Thew huge world forces you to regularly consult the minimap, which only gets updated as you reach one of the benches as safepoints. It makes exploration all the more rewarding but also dangerous. A huge reason why there is so much substance to the world of Hollow Knight is the absolutely stunning musical score by “Christopher Larkin”. It manages to create a dense atmospheric blanket of ambient sounds and music around your ears, ranging from sad orchestral piano pieces when you enter Dirtmouth to sounds reminiscent of “Spirited Away” as you venture through dense forest areas. Some areas are even devoid of music, making it strike you all the harder. A sad undertone permeates the whole soundtrack, keeping the world tied together and believable. 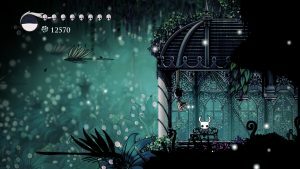 Add to that some amazing sound effects and the unique “language” of all of the insectoid inhabitants of Hallownest and you come to just once conclusion: The sound-design of “Hollow Knight” is nothing short of fantastic and clearly elevates the game from great to outstanding. 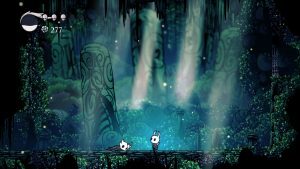 After so much light, there is also darkness which shall not be forgotten in this review: Hollow Knight is extremely well-crafted start to finish, but the map-designs and mechanics feel a bit same’y and not as organically implemented as in similar titles such as Ori and the Blind forest. Still – including a bearable chunk of backtracking you are looking at 25-30h of high quality content to venture through. The lack of direction can make this feel a bit more tedious than it should be, sometimes even encouraging you to dive through a Wiki for details. But mechanics are in place to make sure to can still discover most hidden spots on your own via the use of some sort of dialogue hint or ability. Even after the game’s end each further minute of exploration will reward you with a metric ton of items, abilities and charms, all of which allowing you to adjust the challenge and enjoyment to your individual needs. Sadly, this also means that not finding these upgrades can make your experience vary wildly or even frustrating. However, if you do like to suffer, there’s a perma-death mode to unlock for the inclined (say: masochistic) gamer out there. Not finding everything is not a bad thing though, because there are branched exclusive path decisions in the later game which justify a 2nd playthrough. As of this review the Dev’s are still adding more content beyond the 100% completion! It shows to me that Hollow Knight is a work of true and heartfelt dedication! 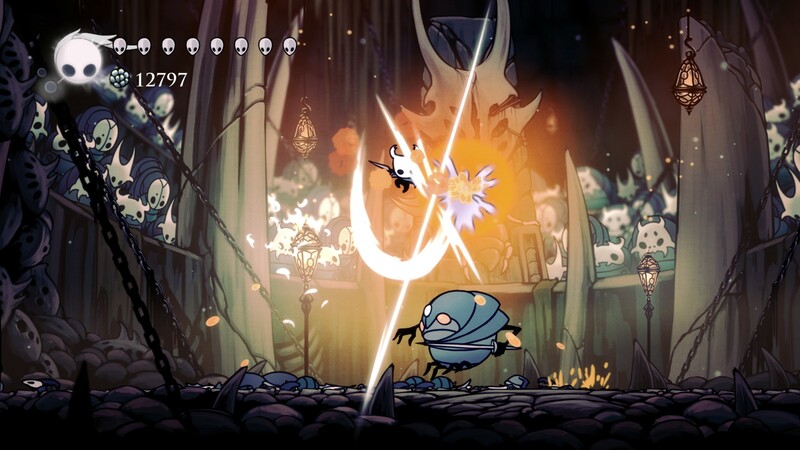 “Hollow Knight” is packed to the brim with high-quality content. At its price point of 15$ for more than 25h of enjoyment it’s more than a bargain. The soundtrack in itself is worth any dollar you can throw at it and it can easily stand on its own 8 legs. 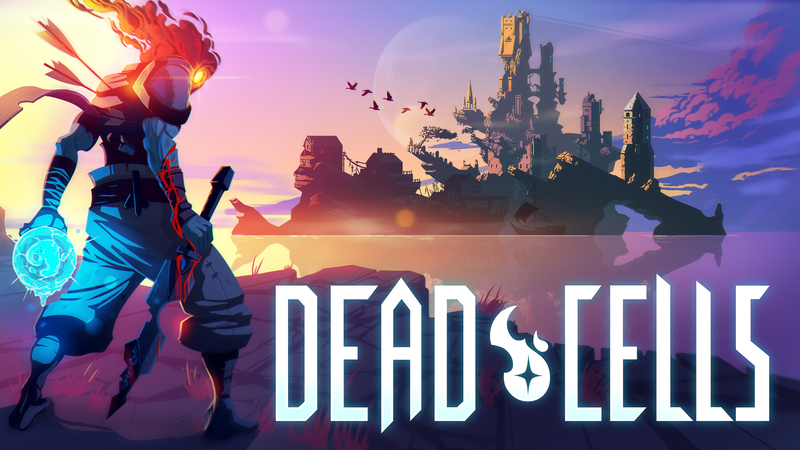 If you can muster the agility and nerves for a truly challenging platformer and crave for an in-depth indie experience to keep you hooked for days, wait no longer and buy this game already!! Team Cherry has outdone themselves with “Hollow Knight”, making it my game of the year 2017 by a wide margin. +Fantastic world to explore and dive into, keeps on giving!